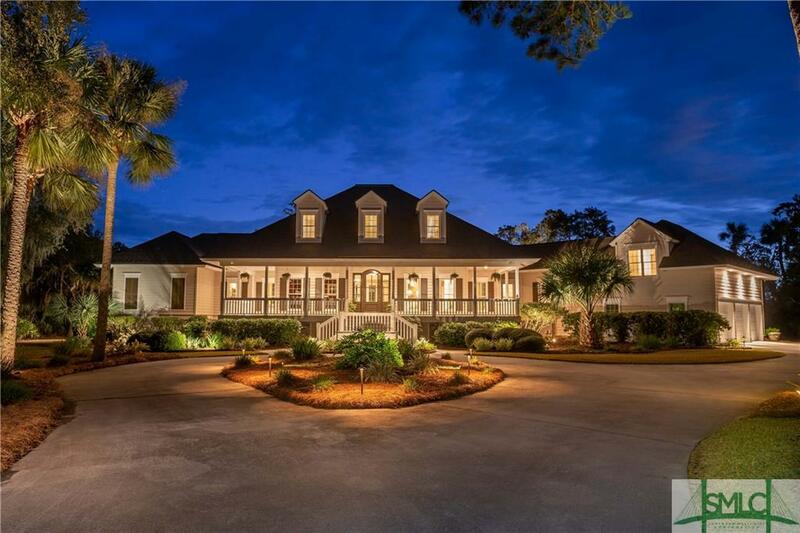 Southern style awaits you in this exquisite 5 BR w/4 full & 2 half baths situated on 1.07 acres w/incredible southern marsh & water views. This home was built for entertaining, featuring a newly renovated gourmet kitchen w/custom white shaker cabinets, amazonite granite & quartz countertops, SS appliances & Sub Zero refrigerator. Step into the grand entrance of this home to a large executive office w/gorgeous mahogany bookshelves & judges paneling, amongst a comfortable floor plan & awesome natural light. This home has an abundance of closets & storage space. The Master BR features doors opening to back porch, his/hers walk-in closets w/built in storage for shoes & linens. An exercise/sitting room adjoins the master bath w/windows facing the marsh. Energy efficient home features 4 new HVAC systems, roof is 5 years old, Rhinoshield paint & an encapsulated crawl space. Triple car garage w/workshop, space for additional freezer & fridge. Irrigation system for the beautiful landscape.